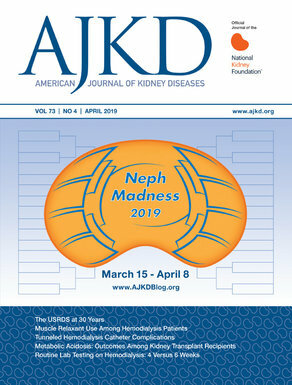 The AJKD blog editorial team is always trying to find interesting blogs related to kidney disease. Below is a list of blogs that are updated regularly. If you have or know of a blog that should be listed please let us know. Demystifying kidney disease for the average Joe! Patient-centered blog created by Dr. Veeraish “VC” Chauhan. This blog aims to make evidence-based medicine understandable to the lay person in “plain-English” without the doctor’s jargon. Global Kidney Academy Online global nephrology portal created by Dr. Meguid El Nahas and Dr. Arif Khwaja. Contains many resources for nephrology-based learning including a blog and many other resources. GlomCon– The Glomerular Disease Study & Trial Consortium (GlomCon) aims to bring together clinicians, pathologists, researchers, and biotech innovators to create a scalable network of stakeholders interested in helping patients with glomerular kidney disease. Last Month in Nephrology– Blog from Tukaram Jamale and Vaibhav Keskar. They review all of the current literature over the last month. Leo Riella Transplant blog of Leo Riella. The Nephrologist A nephrology minded blog by Dr. Vanessa Grubbs who is a faculty member at San Francisco General Hospital. NephJC The online nephrology journal club. Created by Joel Topf and Swapnil Hiremath. NephSIM A mobile friendly teaching tool based on interactive cases. Created by Samira Farouk and Rachel Hilberg. Nephron Power An academic blog created by Dr. Kenar Jhaveri. Covers a wide range of nephrology-related topics. Precious Bodily Fluids Personal blog of Dr. Joel Topf. Provides commentary on all things kidney. Also known as Musings of a Salt Whisperer. Renal Fellow Network Website created by the late Dr. Nathan Hellman maintained by current nephrology fellows around the US and world. UKidney Educational portal created by Dr. Jordan Weinstein based in Canada. Contains a variety of educational materials, a blog and forum for discussion of nephrology related issues. Washington University in St. Louis Nephrology Web Series– Tim Yau’s YouTube channel with teaching cases.